« Are the Lakers Truly Better Than Their Record? Byron Scott to Make Lakers Starting Lineup Changes: Who’s In, Who’s Out? 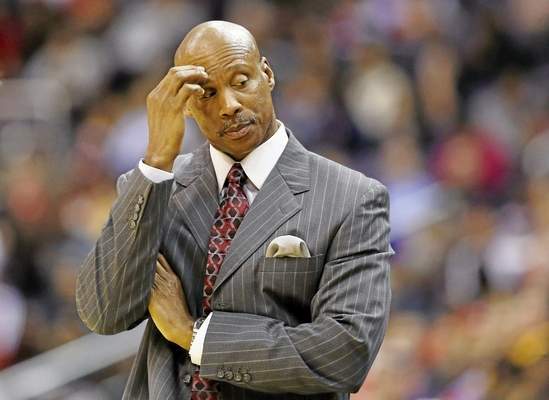 Coach Byron Scott ponders lineup changes. Newsflash. Lakers still stink. They show quick glimpses of hope by way of a few wins and then they go back to losing. They have dry spells, 3rd quarter lapses and 4th quarter meltdowns. They have minimal help for Kobe on offense, their defense creates layup lines, players look disinterested at times and Byron Scott has had enough. So guys gotta sit the bench. But is this going to work? It’s certainly worth a try. The Lakers for the first time in a couple years has had the benefit of starting lineup consistency and have squandered it. This lineup is bad, real bad– Michael Jackson (#kanye)! Let’s look at it this way. If Byron is truly in harmony with Lakers management, which I think is true, players should take note when coach benches you. This should create an urgency to earn your minutes or be benched, waived or traded. This is important because the concern with benching players is this drops morale and can create friction and negative energy. Management needs to back the coach. Because this is necessary. They are losing bad! You’d hope players are on board with doing anything for the team. So how should Byron do this? Who’s benched? I’m on the edge of my seat and here’s what I hope for. Lin is NOT the starting point guard. Everyone has said it. He and Kobe cannot coexist. Mainly because Lin can’t be alpha dog mentality with Kobe. He won’t. That’s not his persona on a consistent basis. So chemistry suffers. Defensively, he’s still not quite there either. He’s not that dude. So somebody has to replace him. In pre-season Price and Kobe did well because Price simply set Kobe up. Price doesn’t feel pressure and didn’t seem to cave in to it. Upgrade? Not really but it also gives Lin an opportunity to run the offense in that second unit. Carlos Boozer is NOT the starting power forward! Mainly this is a defensive issue. The fouls, the getting beat on defense, it’s becoming an issue. Maybe he’s not working well with Kobe either. Something is lacking though. He needs to join the bench mob. I love the Lin – Davis connection, so perhaps it’s time to put Sacre at center and move Hill to power forward. I also am for Davis starting too. This actually helps Kobe and Hill with Davis being the big man down low and Hill and Kobe with the mid-range game. Either move will help defensively. How Booz will take it? I don’t know but it’s necessary that he finally take a seat. (Wish Randle was here). Wesley Johnson was given ultimate trust by Byron Scott and we didn’t see that new Wesley. Wesley Johnson is NOT the starting small forward. Purely for that inconsistent play. With Lin going to the bench, you can either have Lin and Young on the wings on that bench, or bring Young in as starting small forward. The Lakers need energy in the starting lineup AND consistency. Now Swaggy P has been known to falter a bit as a starter, so I’m on the fence about this. Kobe can also move to small forward to replace Johnson, inserting Ellington to the 2. No matter what Johnson is going to join the bench mob. The only two guys guaranteed a starting position are Kobe Bryant and Jordan Hill. I’d be shocked and disappointed if I didn’t see 3 new guys alongside them. I’m also not opposed to Byron developing his youth. Maybe we bring Roscoe Smith and Jordan Clarkson from the D-league and give them some minutes. Also, sign Earl Clark immediately as another small forward option. Chemistry and wins also develop faster with better players. Lakers are mum about trades but I’m sure there’s something on the horizon. It’s not like Byron has a plethora of options to choose from. Overall they don’t have players that would ever really start on a championship contender. Grant it, any player can shine given the opportunity. This is what we have left to hope for in the case of our beloved Lakers, that somebody steps up. With the Lakers being this horrible right now, there is still nowhere else to go but up. Let’s start with the starting lineup and see if Byron can at least find a competitive combination and go from there becase you just don’t get killed by the Boston Celtics! This entry was posted on December 7, 2014 at 4:51 pm and is filed under Kobe Bryant, lakers, nba, sports. You can follow any responses to this entry through the RSS 2.0 feed. You can leave a response, or trackback from your own site.